It’s finished! After months and months (and months! 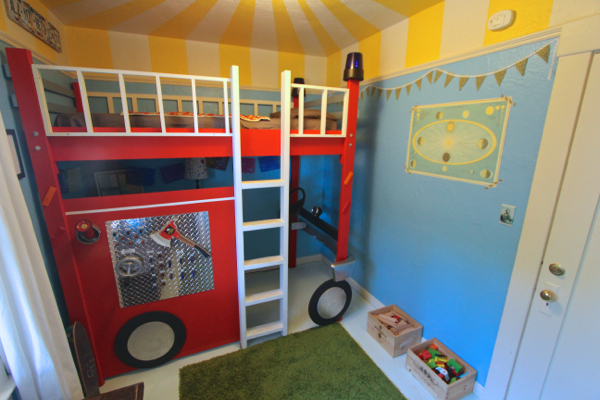 seriously, oi) of working in our spare time, Jeremy and I have finally finished Waits’s bedroom makeover. It’s so exciting! And what a labor of love. This is a project that started off ambitious and then progressively spun further and further out of control. But Jeremy and I were having so much fun! Can’t really blame us for that, eh? 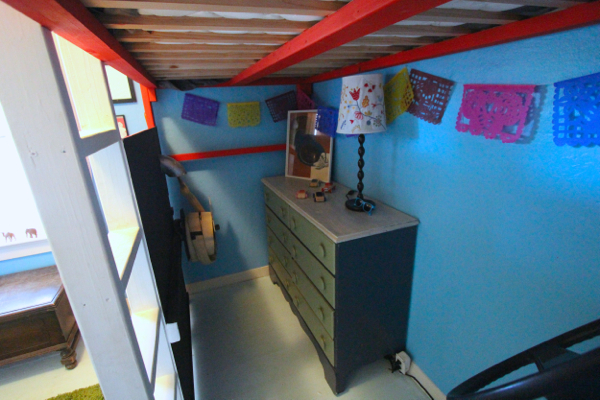 I’ve gotta to say, I see a lot of Pinterest bedrooms that seem to be designed more for the parents than for the actual kids. And I didn’t want that. So as you’ll see, this isn’t some hip Scandi minimalist space, haha. 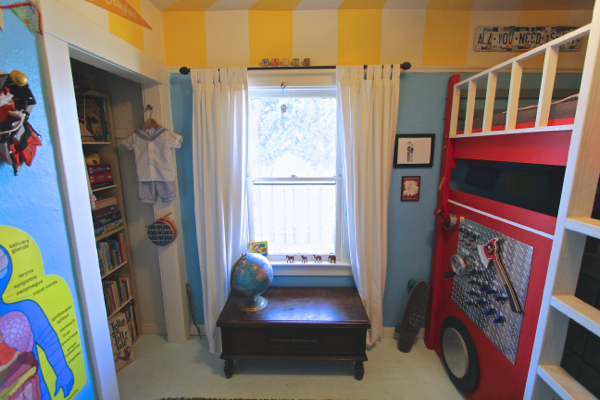 I really just wanted to fill this teeny tiny room up to the top with the things that Waits loves, with items that interest him and that are meaningful in our lives. 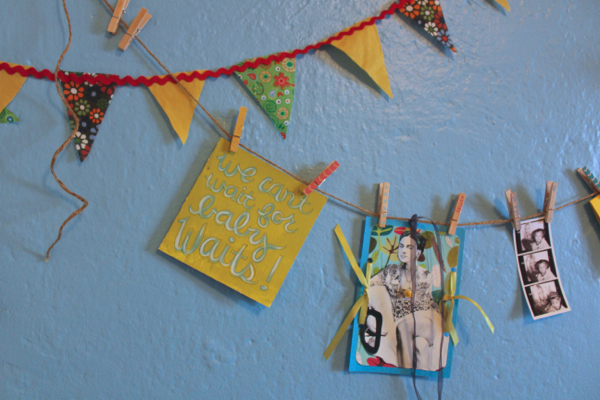 It’s a good blend of vintage, family history, and hand-me-downs, combined with flashy, fun modern stuff. It’s everything that he loves and it’s all for him, and that’s what matters to me. Okay, now here comes a million pictures! 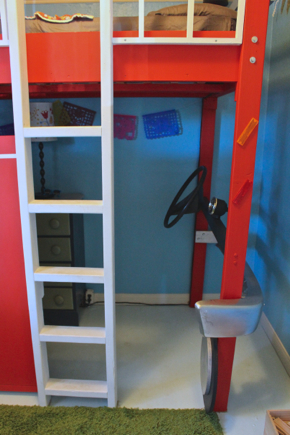 First, the pièce de résistance: the fire truck bunk bed that Jeremy designed and built from scratch. The lights really light up. The control panel is real diamond plate steel, fitted with real switches and buttons. We got a real bumper, gauge, and steering wheel from the junk yard. And the fire hose and nozzle (which unravel far enough to reach the living room!) are real as well – a vintage model that Jeremy scored on Ebay. The front wheel swivels on a hinge for easy entrance. 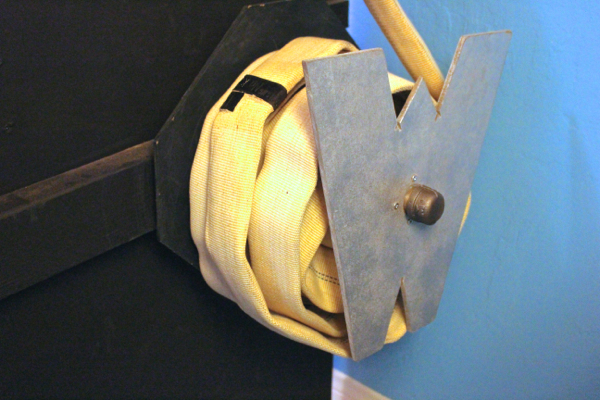 The firehose winds on a custom “W” spool. Charles Darwin. I DIYed this using one of my old textbooks. 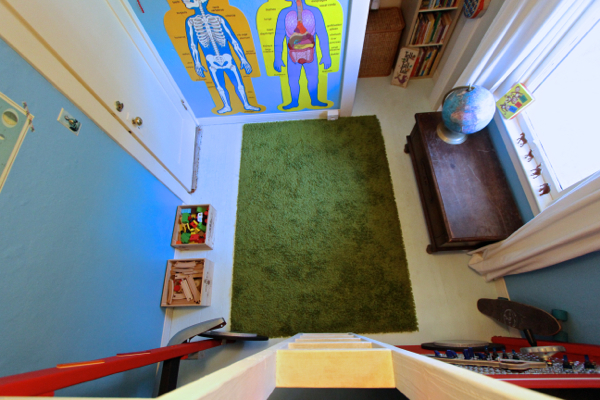 I gave Waits those giant anatomy posters for his 4th birthday. He’s completely obsessed with the inner workings of the human body. 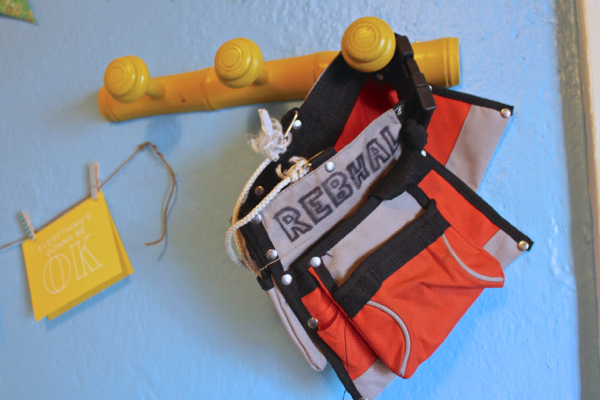 And the pennant above the closet is vintage 1950s Disney – a reminder of his birthday adventure! 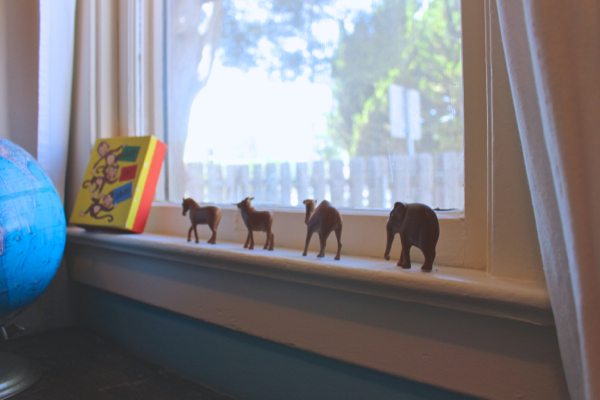 This little wooden animal set belonged to my grandmother. I used to play with them as a child. I picked up these vintage blocks when Waits was 6 or 8 months old, at a flea market in Portland. That top drawing was done years ago by a blog reader. It’s a family portrait of Damian, Waits, and me. 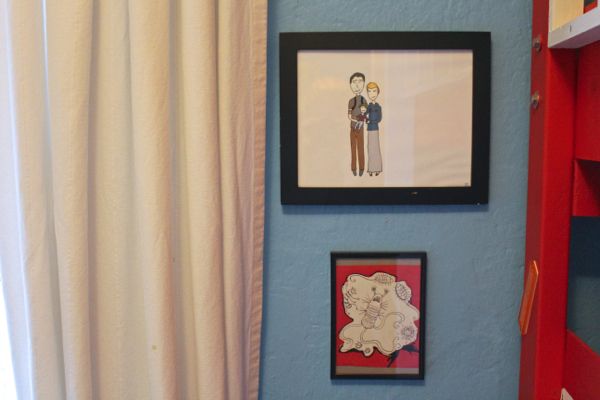 I feel like it’s important to reinforce visually what Damian and I always tell Waits: we are still a family. The lower drawing was done for me years ago by one of my closest friends. It features a wacky variety of “creepy crawlies” (I did my undergraduate research studying parasites). Made by a local artist. And that’s that! Before I go, I just want to take a moment to thank the person who made this all possible. 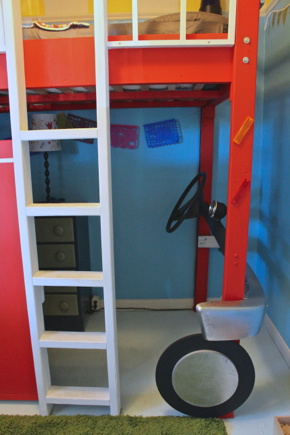 Jeremy conceived of the fire truck bunk bed that started it all, but that was just the tip of the goliath ice berg that ended up being the bedroom project. From coming home late and finding him tearing up the old carpet, to seeing him spend his days researching materials and options, I can say with 100% confidence that none of this would have been possible without our strength, our motivation, and our never ending FUN – our Jeremy. Thank you baby. From both of us. 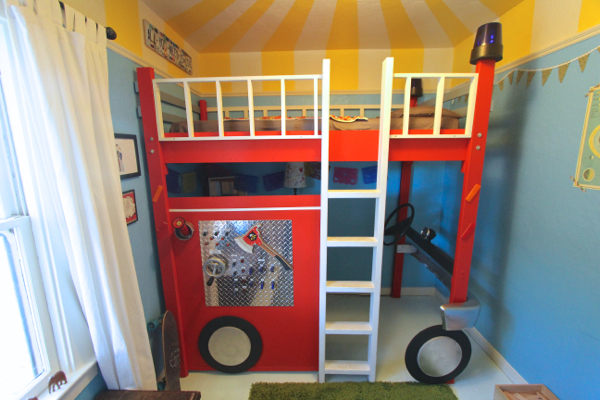 This bedroom is what kids’ dreams are made of! What an amazing result after all that hard work. Hope Waits loves it. The detail is amazing. It looks wonderful! This is so awesome! 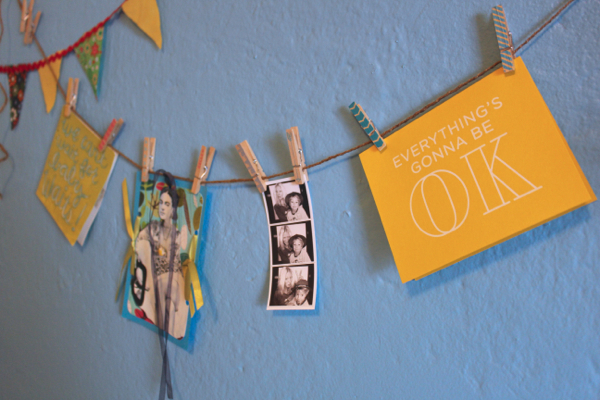 What a fantastically personalized space. 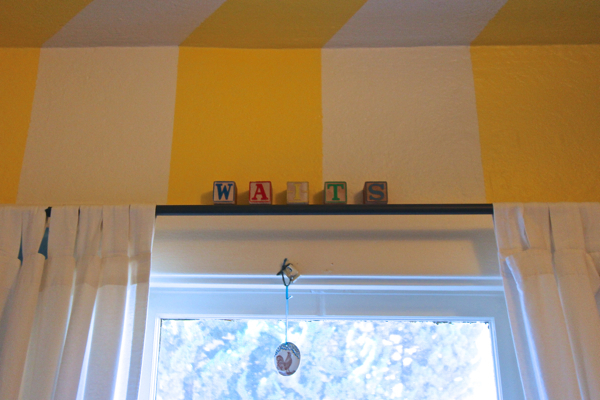 You can tell Waits is really going to grow (body and mind) in that room. 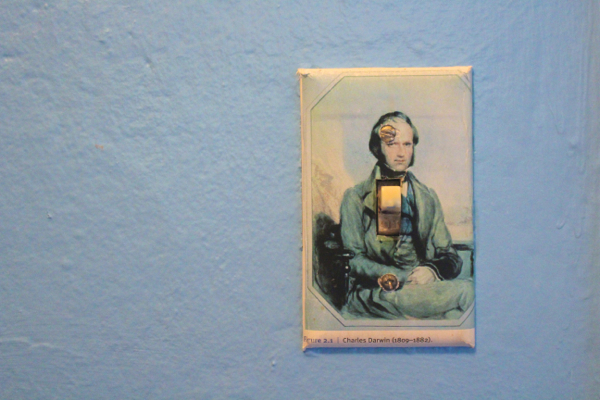 Love the Darwin lightswitch cover. 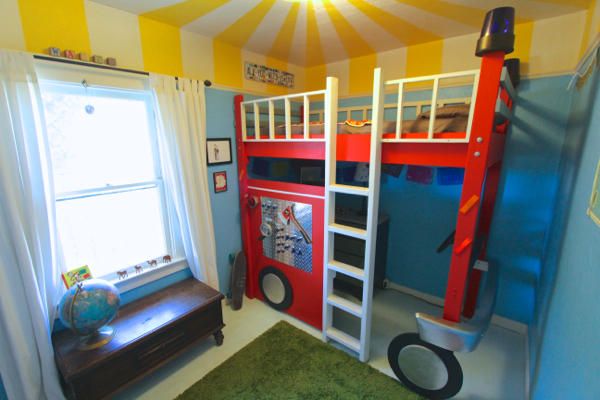 what an amazing bedroom for an amazing little boy! wow! What an amazing bedroom,Waits must be thrilled!!! That is A-number 1 the coolest bed ever. 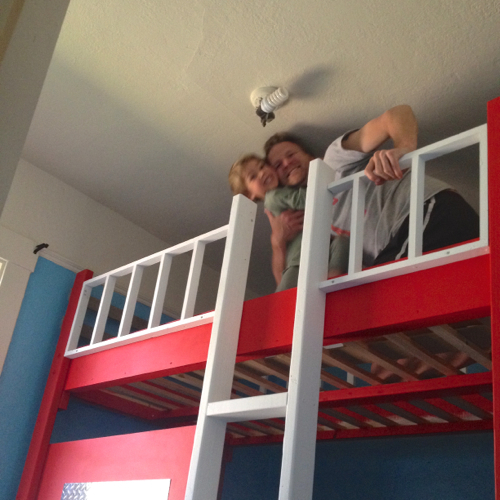 We have been talking about building a loft bed for our girl – did Jeremy follow a plan he found or make one himself? If it’s something he could share, we would love it. My daughter is committed to the idea that the bed is something she and her dad will build together, but her dad wants to be sure that it’s something they can build safely. And this concept could be adapted to any theme – my first thought was rocket ship! Did you know that many cities’ fire departments will do kids’ birthday parties at their firehouses? 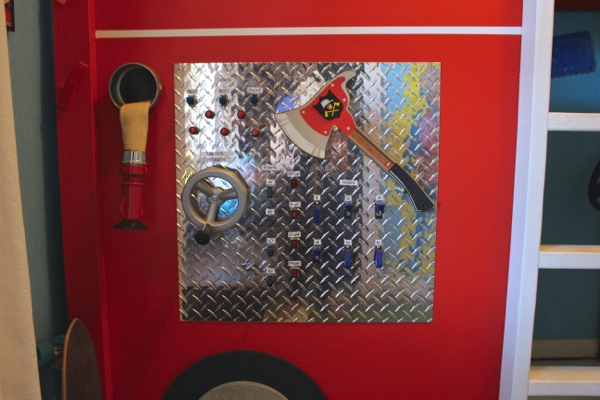 My daughter had her 3rd bday party at ours – they toured the kids around the trucks, let them climb on and in the various trucks, showed the kids what a firefighter in full suit looks like (so they won’t be scared if the situation arises), and talked about safety plans. It was awesome (and free) – all the kids and all the parents thought it was the coolest party ever. What a beautiful, perfect room. I love all the thought that went into every part of it! Waits is (and has always been) such a lucky kid to have so many adults in his life who truly care about him. The family portrait and your comment are so sweet. It’s really inspiring how you guys make it work with Waits’s best interests at heart. 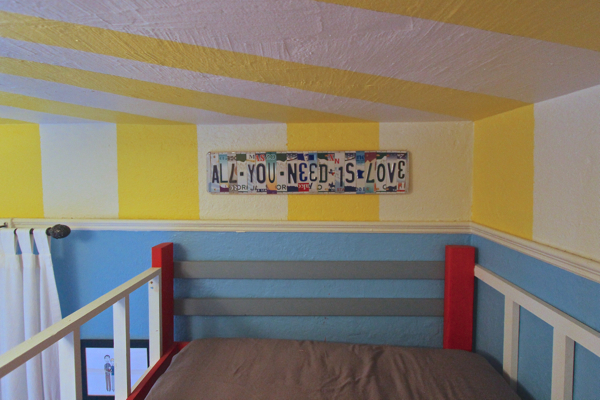 If you used any kind of special eco- or kid-friendly paint, would you mind sharing the details? We’re buying our first house and I’ll finally be able to paint walls! But jeez, there are SO many options and things to consider. Thanks for any tips you can share! Seriously so awesome, thank you for sharing!! This is great inspiration, we plan to do something similar for our 4 yr. old next winter in her small 2nd bedroom – with room for a crib underneath so we can fit in baby #2 (due in Oct.!) also! That is awesome! You are so incredibly creative… What a lucky little guy to be on the receiving end of so much love from you both! Oh my god, this is FABULOUS! So bright and cheerful and just perfect. I bet the look on his little face when he saw it put together for the first time made every bit of blood, sweat and tears totally worth it. What an accomplishment. I hope you can stay in your little house. Have you any further news about the sale & how it will affect you? Thank you Lisa! I grew up in a similar situation surrounded by lots of parent-type adults around me who loved and supported me and I feel so fortunate for that. I hope Waits feels the same way. Well, thank YOU for sharing as well – I saw some traffic from a backlink and followed it to see you had shared this post on a forum. So thank you! 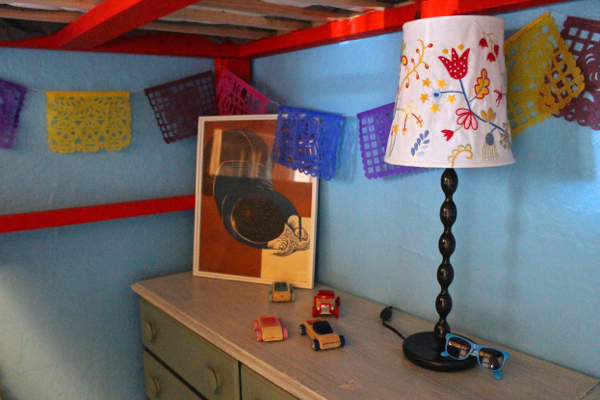 And so fun doing a bedroom makeover for your little one (and impending little one) (!!!). The raised bed is perfect for that and a little crib or even toddler bed would fit so perfectly underneath. Yay! Are you going to do a theme? Aw, thanks Kelli, that’s such a sweet thing to say. So many of my friends are artists and I often feel like the uncreative one, so that’s really special to hear! Thank you. Aw thank you Kittee. Coming from you – my decorating guru (seriously!) – that means a LOT! HI Cara, thank you so much for asking, that’s so thoughtful! So the sale did go through but the new owners seem content to focus on some of the other, more run-down (and illegally expanded, apparently) bungalows for now. The property manager/repair guy insists we are in the clear for at least a year. I’m crossing my fingers! That’s really good news, Sayward. I’m sure you’re relieved. I know how important a home is & you’ve done so much to make this one yours that you deserve to keep it a while. Wow! It’s just absolutely amazing! 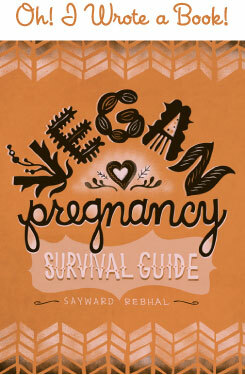 Thank you Sayward! I appreciate your response. 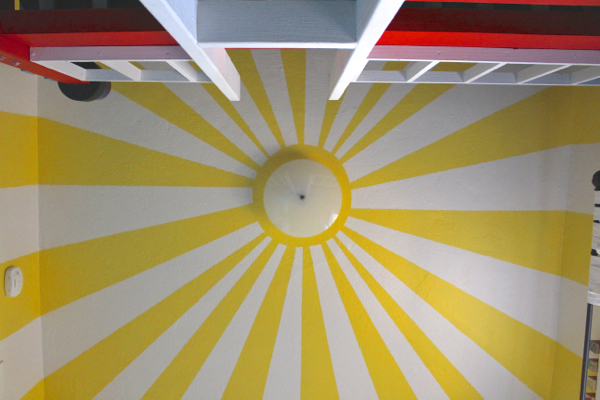 Quiet Home Paints look amazing, but I think we’re likely to go the same route you did. I hope you’re having a fantastic Thursday! AWESOME!!! I’ve been off the blogosphere for a good chunk of the summer, but for good reasons :) I have to say that this blog was one of the ones I missed the most and I’m so glad to be all caught up! Wait’s room looks absolutely AMAZING, Bravo!!! Miss you all!!! This is AWESOME. Thanks for sharing it with us :D So wonderfully inspiring in many ways. 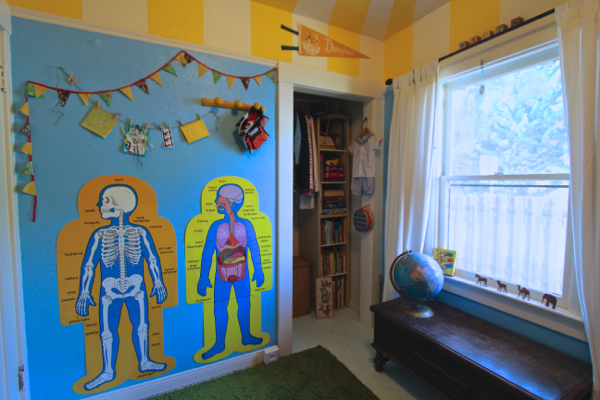 where did you find the child anatomy posters? Great idea.